Đề thi học kì II môn Tiếng Anh lớp năm 5 2015 trường Tiểu học số một Mường Nhà, Điện Biên gồm hai phần: Nghe, Đọc và Viết, giúp các em học sinh ôn tập Tiếng Anh cuối cấp hiệu quả. Đề thi có đáp án và file nghe đi kèm. 1. Does Mai do morning exercise? 2. Does she brush your teeth twice a day? 3. Does she eat fast food every day? 4. Does she always wash her hands before meals? 5. Does she play computer games every day? 1. A: What’s the matter with Minh? B: He has got a toothache. 2. A: What’s the matter with Bin? B: He has got a stomachache. 3. A: What’s the matter with Bo? B: He has got a backache. 4. A: What’s the matter with Linh? B: She has got a sore eye. 5. A: What’s the matter with Tim? B: He has got a cold. 1. A: Should he play with the lighter? B: No, he shouldn’t. Because he may get a burn. 2. A: What shouldn’t he do? B: He shouldn’t play with the knife. Because he may get a cut. 3. A: What shouldn’t he play with? B: He shouldn’t play with the cat because it may scratch his face. 4. 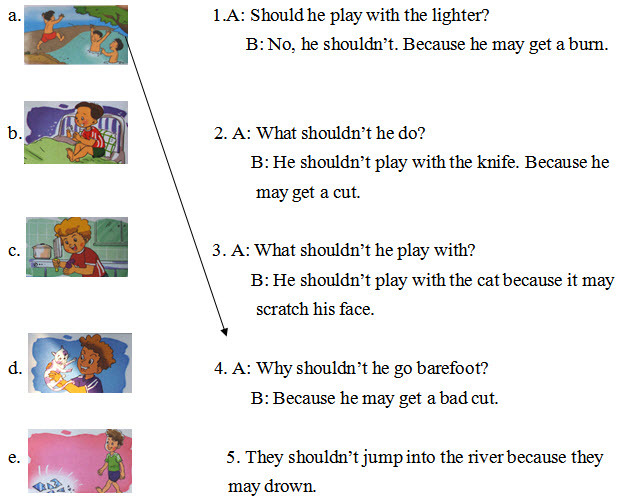 A: Why shouldn’t he go barefoot? B: Because he may get a bad cut. 5. They shouldn’t jump into the river because they may drown. Mai is a good student. So she always gets up early and does morning exercise. Then she takes a shower. After that, she brushes her teeth, has breakfast and goes to school. She always brushes her teeth twice a day. She never eats fast food because it is not good for her health. She always washes her hands before meals. She sometimes plays computer games. She does not play every day. 1. A: What shouldn’t the girl do? B: She shouldn’t touch the hot tea pot because she may get a burn. 2. A: What shouldn’t the children do? B: They shouldn’t swim in the river because they may drown. 3. A: What story does she like? B: She likes animal story “The clever fox and the crow”. 4. A: What is the matter with him? 5. A: What will your dream house be like? B: It is a small house by the sea.